So I continued to design a very farmhousey, cottagey, antiquey room. And seriously, I had so.much.fun with this one. I may have had more fun designing this one than our master bedroom. I also tried to add whimsical touches in here since the overall design was a bit more traditional than I was originally going for. 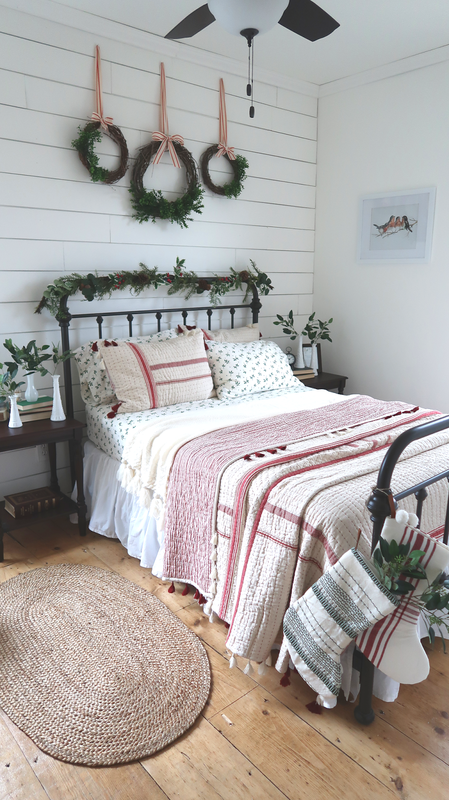 And then, suddenly a few months ago, I started to design a Christmas-y guest room after seeing a quilt that I fell in love with. And of course, my plans turned into a full-blown Christmas bedroom. The room is obviously white. We went with my old faithful, Simply White by Benjamin Moore because, well, you know. We shrank the size of the room down a bit after taking away a part of it for the guest bathroom, so I wanted to make sure it looked as large and airy as possible. The bed is from Overstock and it reminds me of older farmhouse bedrooms. 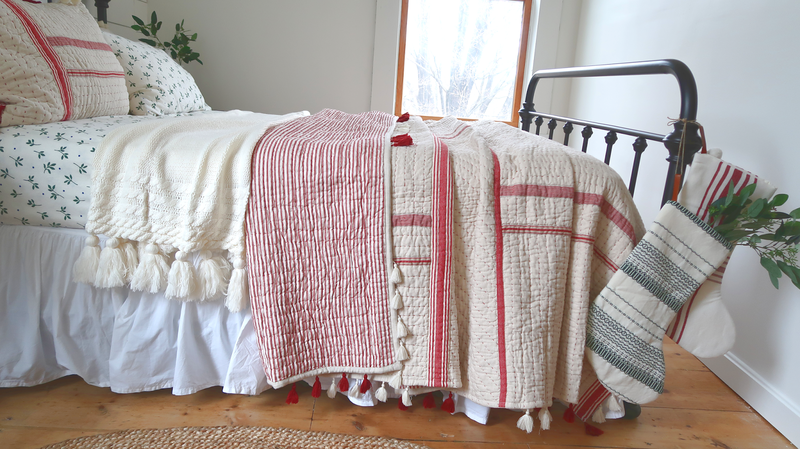 I always pictured this bed with beautiful patchwork quilts and patterned sheets and I searched high and low, for about three years for the perfect, colorful patchwork quilt for our guest room. And I never found it. 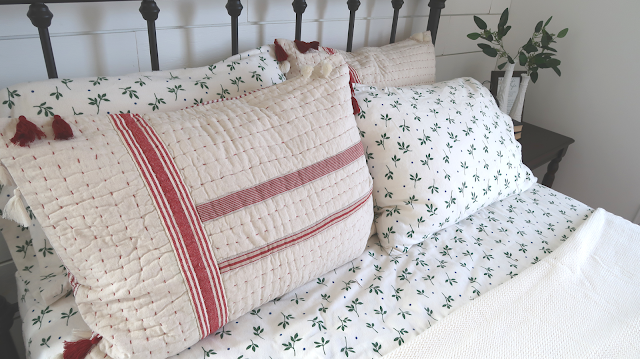 I feel like patchwork quilts can go from lovely and vintage to weird and 80s really fast, so I just gave up and went in a different direction with the bedding I purchased to use year 'round in here. But obviously, I got sidetracked by all things Christmas. We bought these flannel holly sheets at Macy's on 34th in NYC two years ago on a super sale. Seriously, I paid next to nothing for these, and they're such great quality, and incredibly soft. 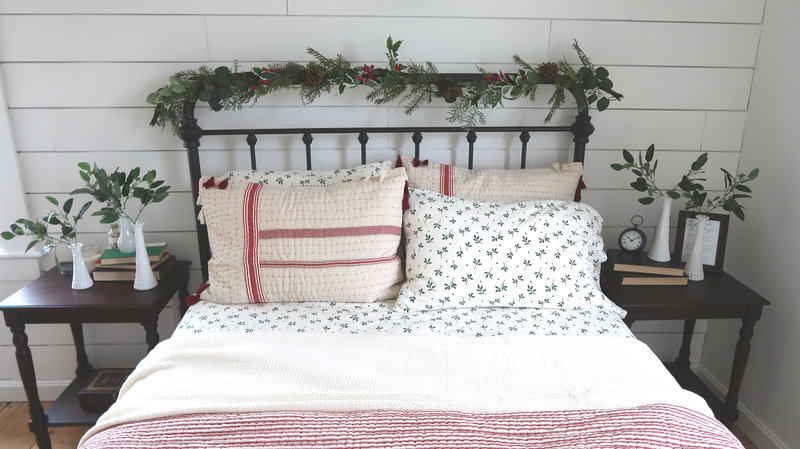 These sheets snowballed into needing some sort of red, patchwork quilt just for the Christmas season, and I waited for the perfect one to come along. And, it did. This quilt is from Pottery Barn, and this is the one thing I spent more money on than I would have liked. 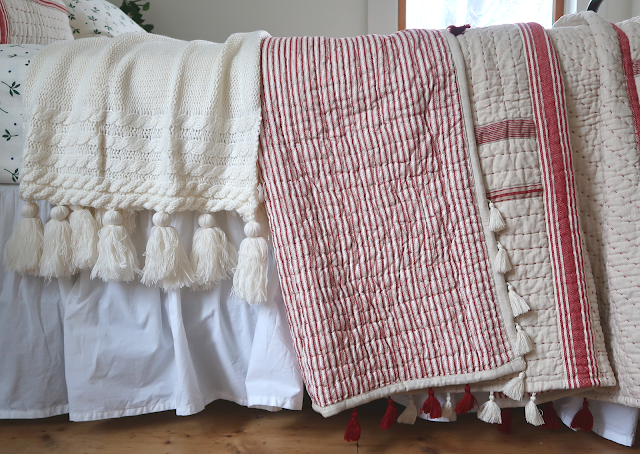 But, it's so perfectly farmhouse with the red grainsack stripes, and also a little whimsical with the tassels on the edges. As soon as I saw it, I pictured it with our holly sheets, and it all came together. Our farmhouse is drafty in the winter, so extra layers are super important. It's always kind of uncomfortable when you're staying at someone's house, and you're either too hot or too cold. 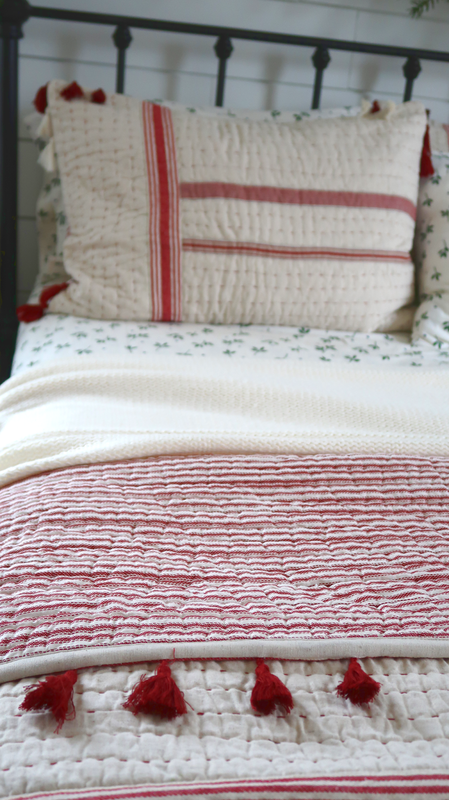 I tried to prevent people from being too cold by adding another knit blanket on the bed for extra warmth. This one from Target is so amazing - the chunky knit and the tassels give it so much character. I found these bedside tables at Birch Lane, and when I bought them, they were on clearance for $68 each, plus an extra 20% off and free shipping. I love the turned wood legs and their dark, antiquey feel. Their measurements just happened to be perfect for the width of this room which made them destined for our home. 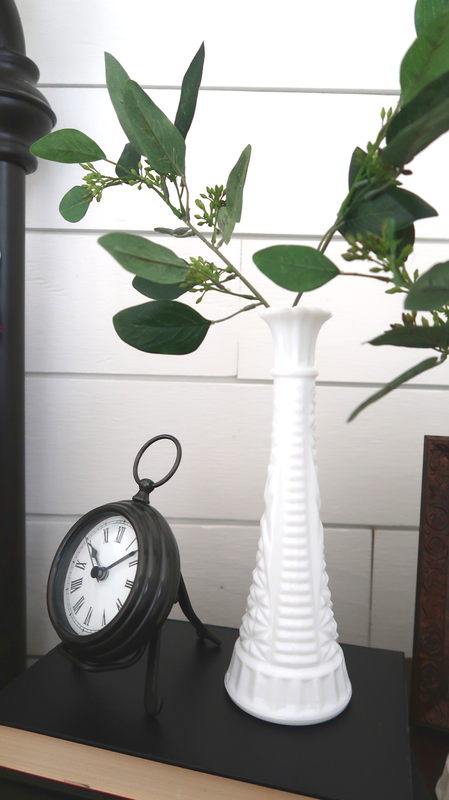 I think I read somewhere that milk glass was most popular in the 60's, but I always associate it with Victorian-esque designs. I'm not sure why. 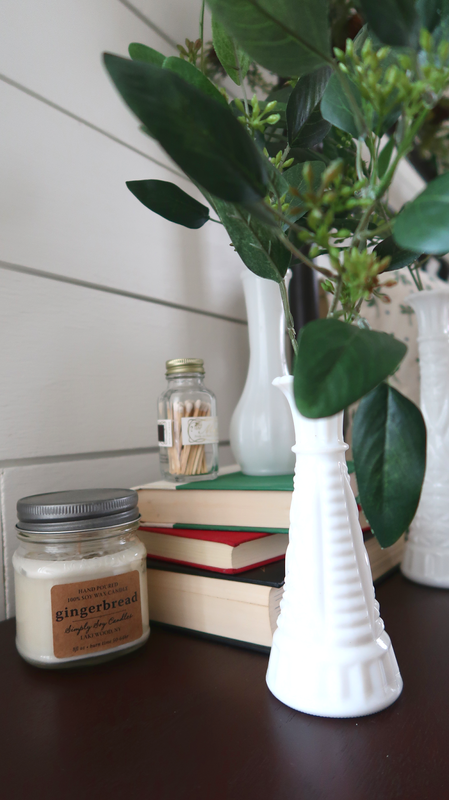 But, I got some really pretty milk glass bud vases from Etsy and eBay and used some faux eucalyptus stems I had leftover from all the wreaths I made for Christmas last year as bedside table decorations. I still haven't been able to decide on lamps for the bedside tables. I bought some from Target that I thought would be perfect in this space, and they turned out to be quite the opposite. I brought in the ones we used to have in our master bedroom, and those didn't work either, and I could never settle of any that just worked. So for now, we're lamp-less in this room until I find the right ones, so thank goodness for hardwired ceiling lights. and you don't know how to access the wifi. I wasn't sure what to put above the bed, and debated a few ideas for a bit until I landed on wreaths (surprise!). 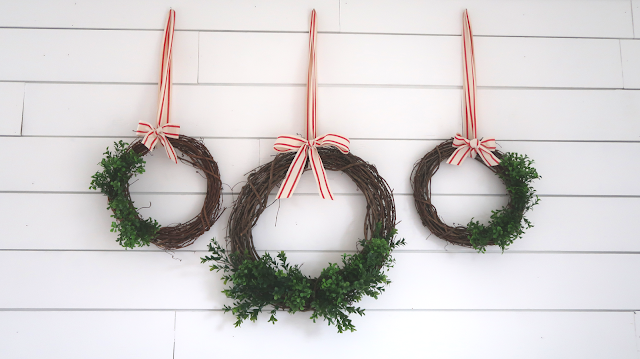 I have a problem with wreaths - I put them everywhere because they make me smile. I love how they add color and texture, especially to an all-white room, so I decided on three above the bed. To make them Christmas-y, I used red grainsack ribbon that I had leftover from last year, which can easily be switched out once the holidays are over. 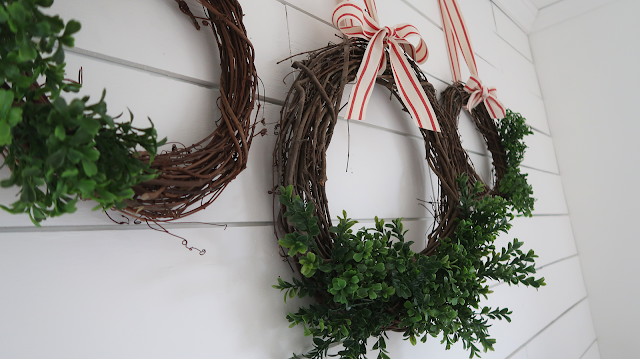 For the wreaths themselves, I decided to keep most of the grapevine exposed, and just added some generic boxwood so they can be left up year 'round. I've had this print from Etsy saved for a while, and I've always known it would go in this room. I wanted a really pretty antiquey, bronze frame for it, but I searched everywhere for months and couldn't find one for less than $100. So, it lives in a simple white frame for now, but I hope to someday find the frame I've pictured in my head. When you first walk into the room, there's a little hallway-esque space, and soon it will be a home for my mom's old antique-y dresser that she had when I was younger, since she's graciously allowed us to have it for this room. It'll go where the little table is, and it also has a beautiful mirror that's attached to it. For now, just to use up the wall space, I hung a wreath above the table for some extra festiveness (Which, I wish I hung a little lower, but whatever). On the actual table, I layered a crochet doily (is that what they're called? I don't even know) down for some texture (I love how these remind me of my grandma's house), and then brought in some candlestcks from Anthropologie we've had for years because they kind of work perfectly in here. 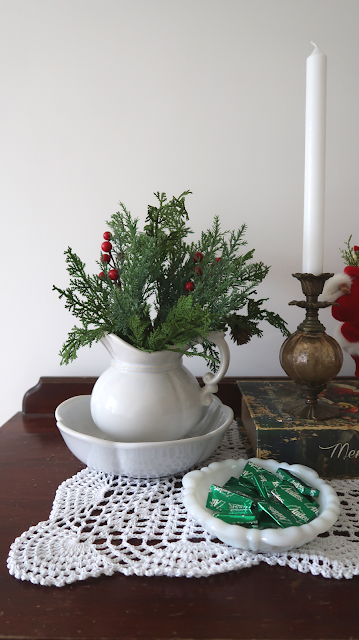 On eBay, I found this cute little pitcher and bowl, and then added a little milk glass candy dish with some chocolate mints. I don't know what I'll do with the table once the dresser comes after Christmas, but I'm thinking it could work next to the rocking chair. Because I love the floors so much, I didn't really want to cover them up with a huge rug. But, at the same time, having a little rug does help add some coziness to a room. 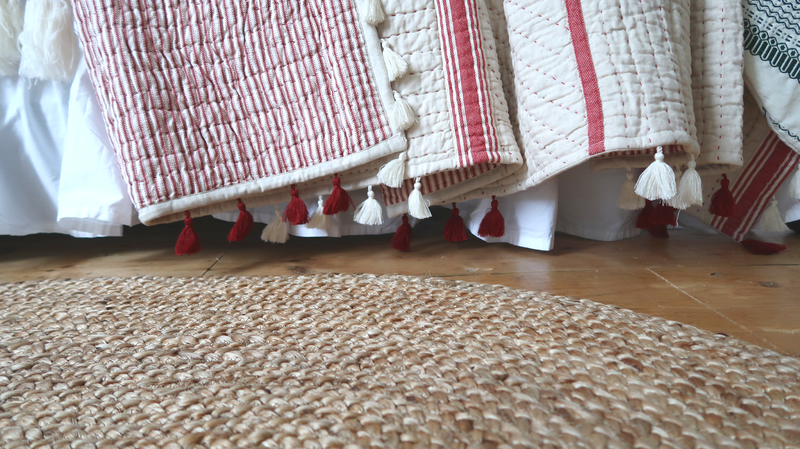 As we were wrapping up the drywall with this room, I got it in my head that I wanted an oval-shaped, braided rug that was natural fiber with some ivory cotton woven through. It's hard to describe, but it's kind of like a rug you would see in your grandma's house or an LL Bean catalog - those are the only ways I can describe it. 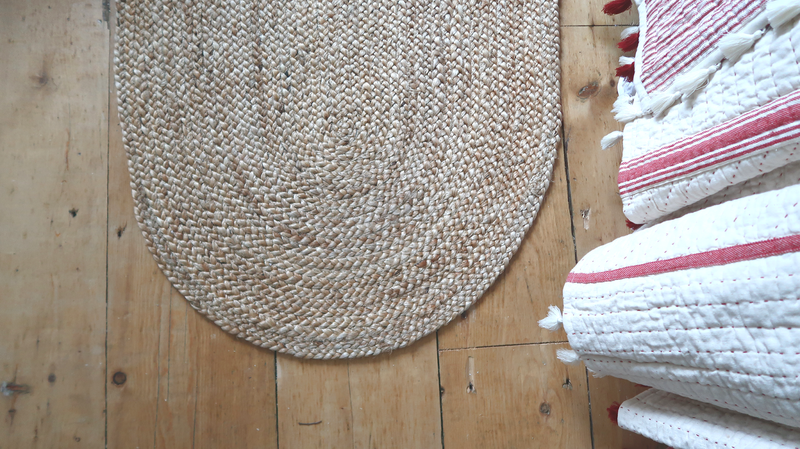 I couldn't find exactly what I was looking for with the right colors, but I did find an oval natural fiber rug that was close enough, and super cheap on Overstock. I really like the shape of it because it seems like something that belongs in an old farmhouse between two twin beds. In the corner is the rocking chair we bought at the Country Living Fair this past Spring. I remember as soon as I saw this sitting on the lawn, it would be perfect for this room. And now that I see it being used in here, I'm happy we've given it a good home. 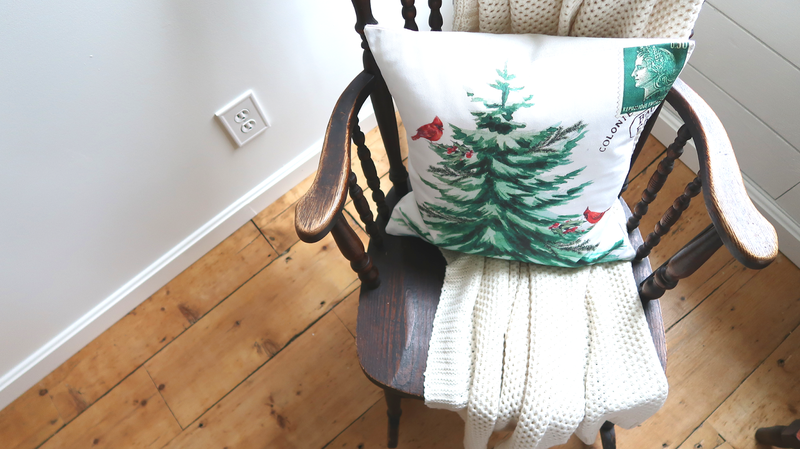 I put a throw pillow on it that I got on Etsy last year, as well as a white knit throw blanket (in case guests aren't quite warm enough yet). And that is all, my friends. We're done with major projects for the holiday season, and this break is a pretty welcomed one. We worked non-stop on the guest bathroom for the first half of the year, and then went right into this room, so we're going to take it easy until after the New Year. I'm really looking forward to getting our house ready for Christmas, relaxing on a Saturday afternoon on the couch with Josh and hot cocoa and watching completely ridiculous Hallmark channel movies with a plate of Christmas cookies. 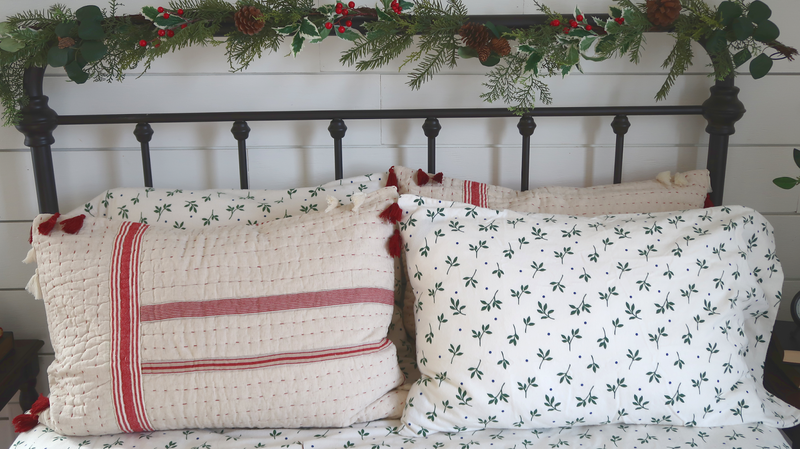 And maybe an afternoon siesta in our new, perfectly Christmas-y, guest room. Ceiling fan is the Auberville style by Hunter Fan. 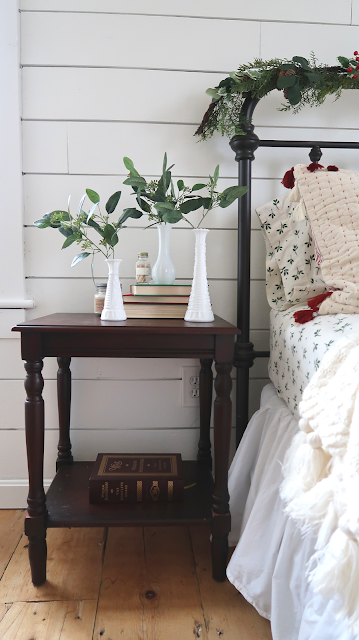 Bed is the Giselle Antique Bed from Overstock. Flannel holly sheets are no longer available (purchased three years ago). Ivory knit blanket on bed is from Target. 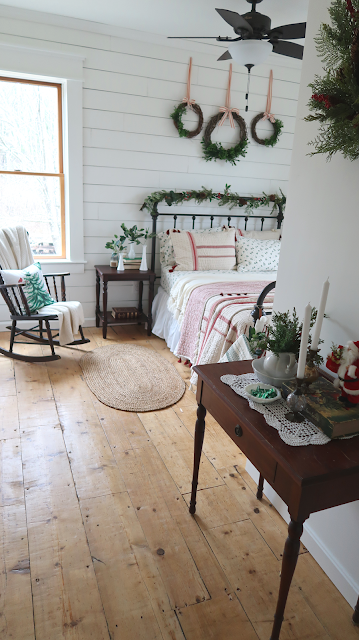 Green & Red stockings hanging from bed are from the Hearth and Hand Magnolia collection at Target. 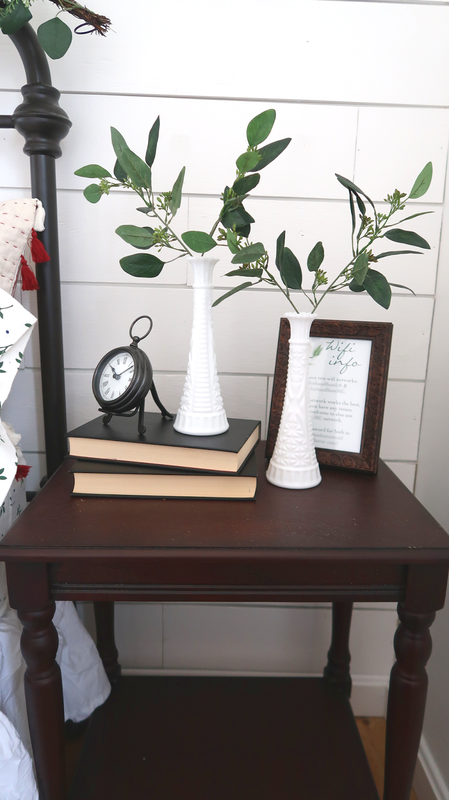 Bedside tables are from Birch Lane - the exact table is discontinued but these are pretty much the same thing. 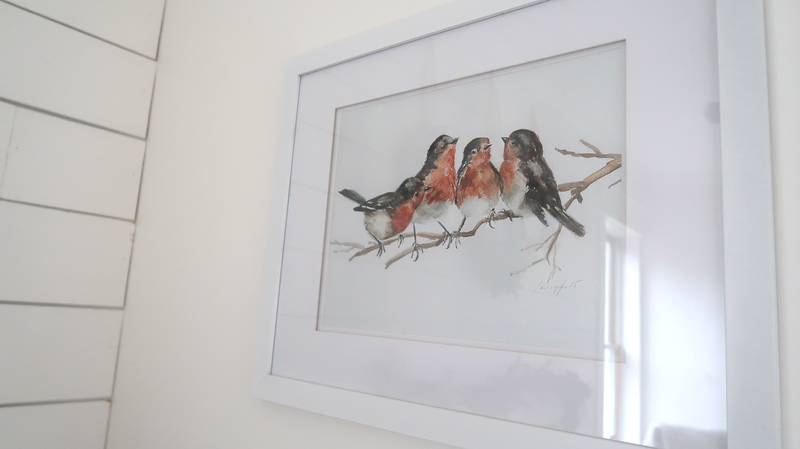 The watercolor bird print is from 1000PaintedTrees on Etsy. Various milk glass vases are from Etsy and eBay (there are a ton for sale and I ordered from multiple sellers). 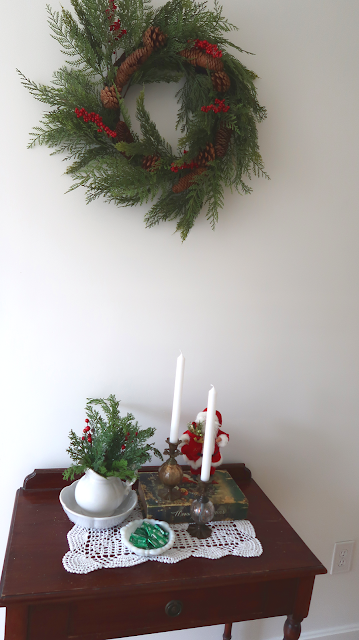 Wreath above little table is from Michaels. 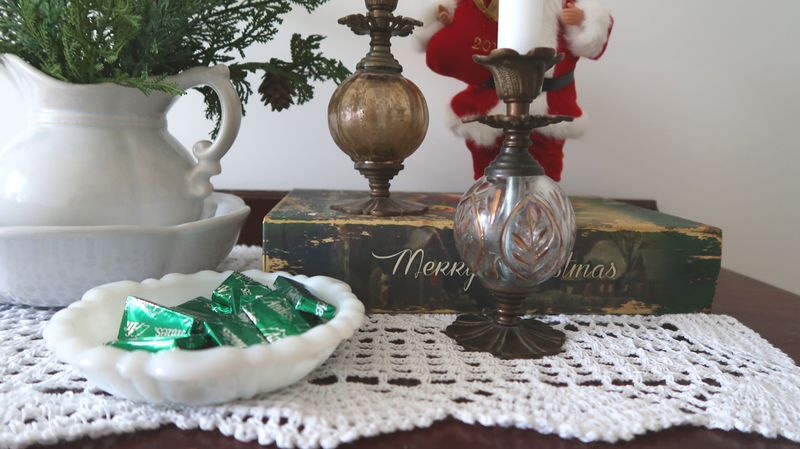 Doily on little table is from Amazon. 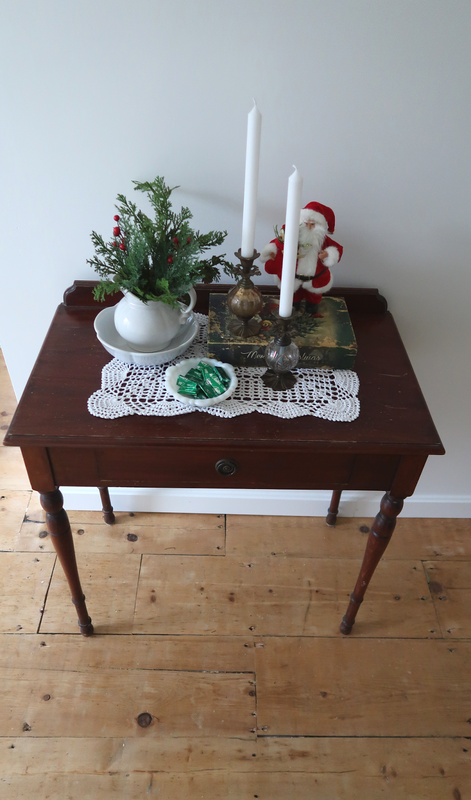 Candlesticks on little table are from Anthropologie from at least 8 years ago. 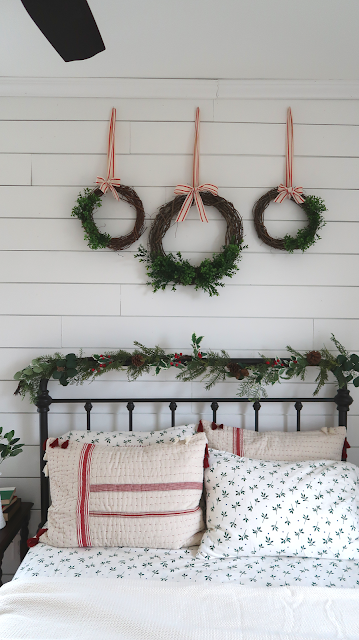 Garland on bed is from Michaels. Bird wall hooks are from Anthropologie, and they're no longer available. 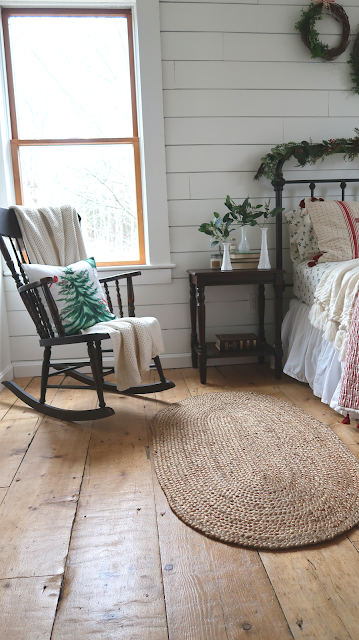 Knit throw on rocking chair is from Pottery Barn*, and is no longer available. Similar here at Target. 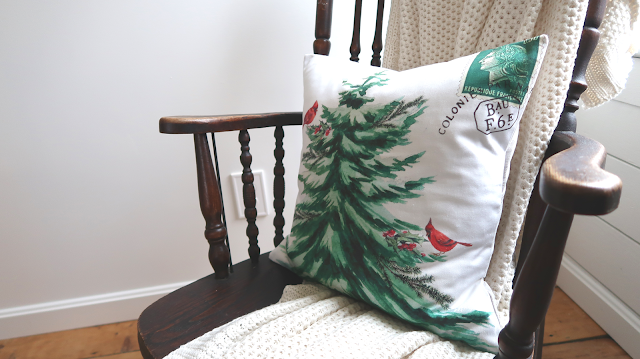 Throw pillow on rocking chair is from JolieMarche. Completely adorable. Just.... perfection. Your guests won't leave, though! I love it. If it were a B&B I'd reserve it right away! Adorable! Your friends and family are lucky!! Can I book my visit to your guest room Sam? It is just beautiful. 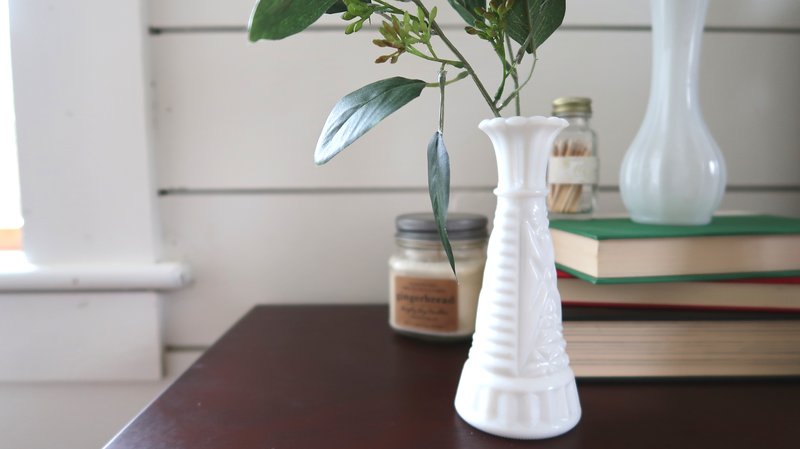 Those old milk glass vases remind me of home. My grandmother had several and always kept some flowers from her garden in them. I also have a little note under the glass of the bedside table in our guest room that gives our Wifi Password. Its the little touches that make a guest feel welcomed and your guests will feel like they are staying at the finest B and B.